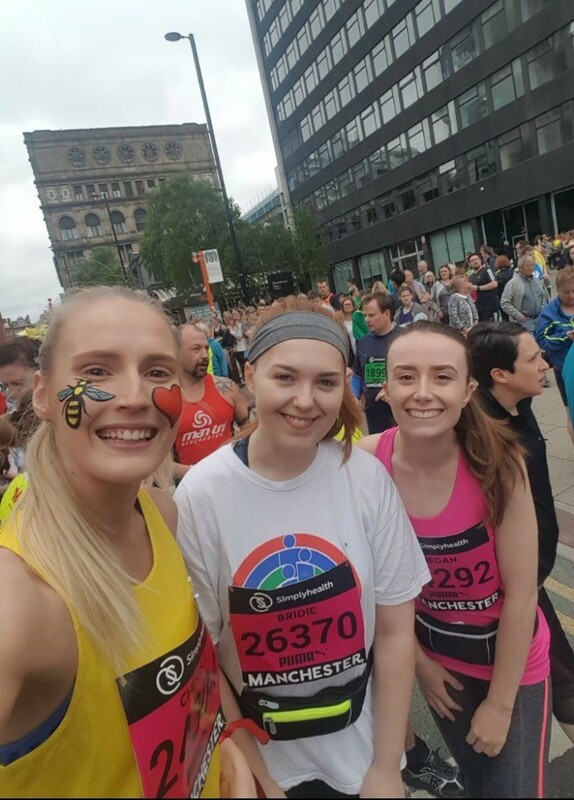 “Over the bank holiday weekend, I took part in the Great Manchester 10K run on behalf of Sequre’s chosen charity, Francis House Children’s Hospice. To say it was an experience would be an understatement and it’s safe to say I didn’t realise what I was getting myself into.Sequre’s chosen charity, Francis House Children’s Hospice. To say it was an experience would be an understatement and it’s safe to say I didn’t realise what I was getting myself into. I am not a runner in the slightest, and to be doing it alongside Cherisse who competes throughout the year breaking personal bests and smashing records, I was expecting her to leave me for dust. However, Cherisse, Bridie and I stuck together for the majority of the race and finished within 6 minutes of each other. Having signed up to the race back in November, I fully expected to have trained a lot more than I did. The furthest I managed to run during my training was 3K on the treadmill, so once I reached this point of the race, I just wasn’t expecting my legs to carry me another 7K. Surprisingly, I found that road running was a lot easier than on a treadmill in the gym; you had the breeze cooling you down rather than baking inside a building, and it was a nice surprise seeing the checkpoints of how far you had come rather than constantly checking how far you had run on the same spot. Following on from the horrific attack in Manchester the week before, there was an awful lot of uncertainty within the group as to whether it was going to go ahead and whether we wanted to do it ourselves. There was a point where even my family were concerned for our safety, especially when the threat level was raised. But once it had been confirmed that the race would be going ahead, I knew that I had to do it, and I had trust in the Greater Manchester Police Force keeping me and thousands of other runners as safe as possible. So, we did it. The atmosphere in Manchester on the day was unbelievable. Before each wave, Tony Walsh stood on a podium and read his ‘This Is The Place’ poem which was followed by a minutes’ silence and then an uproar of cheer and applause. It definitely got us pumped for the race ahead. How did you feel after completing it? The support throughout the race was amazing, there were people stood with motivational signs, people cheering you on and young kids holding out their hands for a high five as you ran past. Even the armed police force and paramedics took their time to cheer for you by name, it definitely put a smile on my face throughout the race. The highlight for me had to be during the last 1K when we were coming to the end of Chester Road into Deansgate and we managed to take over the 1 hour 15 minute time keeper, and I could see my boyfriend cheering me on, but even better than that I could see the finish line and I knew I had done it. I managed to finish the race in 1 hour and 14 minutes which I was more than happy with as I had set myself the challenge of finishing within 90 minutes. At first I thought I was going to pass out as I have never ran that far in my life, and I had really bad jelly legs but I threw some water over my face and went and collected my medal.first I thought I was going to pass out as I have never ran that far in my life, and I had really bad jelly legs but I threw some water over my face and went and collected my medal. Words by Megan Farrow, Marketing Executive at Sequre. Megan was one of 8 people who ran on behalf of Sequre for Francis House Children’s Hospice. We’re incredibly proud of our team for dedicating their time to train and take part in the race for such a fantastic cause.